The former director of Sandia National Laboratories says the pressure readings so far have been ambiguous. The initial pressure readings are in an ambiguous range, and officials will have to make a difficult judgment call on whether to keep the well shut in or reopen it, according to Tom Hunter, retired director of the Sandia National Laboratories and a member of the federal government’s scientific team overseeing the test. “If it were a lot higher, it would be an easier decision to make,” Hunter said. Hunter, who witnessed the test from BP’s war room in Houston, told The Washington Post that the pressure rose to about 6,700 psi and appeared likely to level out “closer to 7,000.” He said one possibility is that the reservoir has lost pressure as it has depleted itself the past three months. “It’s just premature to tell. We just don’t know whether something is leaking or not,” Hunter said. 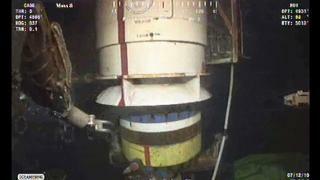 We will need to wait another 24 hours or so – and engineers will have to continue monitoring sonar and visual images (both help determine if any oil is leaking from the seafloor), and seismic data (to determine if there are any new leaks below the seafloor) – before engineers can determine how stable the well is.